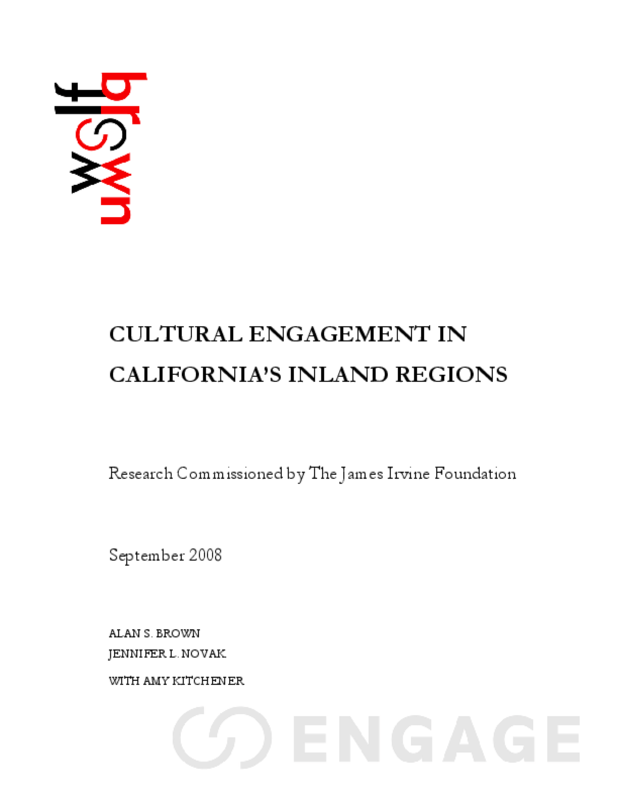 Cultural Engagement in California's Inland Regions explores patterns of cultural engagement in the San Joaquin Valley and the Inland Empire. Two major data collection efforts were undertaken. The first was a door-to-door intercept survey of more than 1,000 randomly selected households in six distinctly different neighborhoods, three in the Fresno area and three in Riverside and San Bernardino. The second was a self-administered survey of more than 5,000 residents of the two regions, promoted as the "California Cultural Census" and conducted online and through intercept work at various locations and events. It is important to note that this second data set aggregates multiple samples, including respondents who were selected at the convenience of outreach organizations. Although weighted to reduce potential biases, these data are not representative of all adults in the two regions. Results paint a detailed picture of the breadth and depth of cultural engagement in the two regions and reveal a range of activity in music, theater and drama, reading and writing, dance, and visual arts and crafts -- much of which occurs off the radar" of the traditional infrastructure of nonprofit arts organizations and facilities. The study identifies specific types of activities which, if supported at higher levels, might equitably raise participation levels and achieve higher levels of cultural vitality in millions of homes and hundreds of communities. It concludes that cultural providers and funders should look deeper into the fabric of their communities for new partners, new settings and innovative approaches to drawing residents into cultural experiences. This briefing provides a high level summary of the study's key findings, as well as discussion questions for cultural providers and funders. Comprehensive results are available at www.irvine.org, including an executive summary and detailed results by artistic discipline. Copyright 2008 WolfBrown and The James Irvine Foundation, all rights reserved. This paper may be reprinted or photocopied for free distribution, with attribution to WolfBrown and The James Irvine Foundation.